(AP) -- The protective ozone layer in the Arctic that keeps out the sun's most damaging rays - ultraviolet radiation - has thinned about 40 percent this winter, a record drop, the U.N. weather agency said Tuesday. 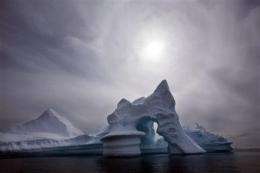 The Arctic's damaged stratospheric ozone layer isn't the best known "ozone hole" - that would be Antarctica's, which forms when sunlight returns in spring there each year. But the Arctic's situation is due to similar causes: ozone-munching compounds in air pollutants that are chemically trigged by a combination of extremely cold temperatures and sunlight. The losses this winter in the Arctic's fragile ozone atmospheric layer strongly exceeded the previous seasonal loss of about 30 percent, the U.N.'s World Meteorological Organization in Geneva said. It blamed the combination of very cold temperatures in the stratosphere, the second major layer of the Earth's atmosphere, just above the troposphere, and ozone-eating CFCs from aerosol sprays and refrigeration. "This is pretty sudden and unusual," said Bryan Johnson, an atmospheric chemist who works in the U.S. National Oceanic and Atmospheric Administration's Earth System Laboratory in Boulder, Colorado. Atmospheric scientists concerned about global warming focus on the Arctic because that is a region where the effects are expected to be felt first. "The Arctic stratosphere continues to be vulnerable to ozone destruction caused by ozone-depleting substances linked to human activities," the U.N. weather agency's secretary-general Michel Jarraud said. Although the thinner ozone means more radiation can hit Earth's surface, the ozone levels in the Arctic remain higher than in other regions such as in the equatorial regions, said the National Oceanic and Atmospheric Administration, whose recent Arctic findings mirror those of the U.N. agency. Ozone losses occur over the polar regions when temperatures drop below -78 degrees Celsius (-108 Fahrenheit) and iridescent ice clouds form. Sunlight on icy surfaces triggers the ozone-eating reactions in chlorine and bromine that comes from air pollutants such as chlorofluorocarbons, or CFCs, once widely used as refrigerants and flame retardants in household appliances. "As sunlight returns, it all comes together to trigger significant thinning of the ozone," Johnson explained. "Mostly the concern, for the Arctic ozone depletion, is for people that live in northern regions, more towards Iceland, northern Norway, the northern coast of Russia," he added, saying they should be more careful outside, wearing sunscreen and sunglasses. As of late March, the U.N. said, the thinning ozone was shifting away from the pole and was covering Greenland and Scandinavia. For the planet, Johnson said, there's the concern that "if this were to happen every year - even though the ozone naturally regenerates itself - you might see a trending downward of the atmospheric ozone layer." After scientists raised warnings in the early 1970s - later earning a Nobel Prize - virtually all the world's nations agreed to the 1987 treaty called the Montreal Protocol to cut back on CFCs used in air conditioning, aerosol sprays, foam packaging and other products. But the compounds have long atmospheric lifetimes, so it takes decades for their concentrations to subside to the pre-1980 levels agreed to in the Montreal Protocol. The ozone layer outside the polar regions isn't expected to recover to pre-1980 levels until sometime between 2030 and 2040. The ozone treaty also encourages industries to use replacement chemicals less damaging to ozone. Some scientists say if that treaty hadn't been adopted, two-thirds of the world's protective ozone layer would be gone about a half-century from now and the CFCs, which also are long-lived potent greenhouse gases, would have pushed the world's temperature up an extra few degrees. Arctic ozone conditions vary more than the seasonal ozone "hole" that forms high in the stratosphere near the South Pole each winter and spring, and the temperatures are always warmer in the Arctic than over Antarctica. Because of the changing weather and temperatures that some Arctic winters experience, there have been times where there is almost no ozone loss, and others when the exceptionally cold stratospheric conditions has led to substantial ozone depletion, U.N. scientists say. This year, the Arctic winter was warmer than average at ground level but colder in the stratosphere than normal. Average Arctic temperatures in January range from about -40 to 0 C (-40 to 32 F) and in July from about -10 to 10 C (14 to 50 F). U.N. officials say the latest losses - unprecedented, but not entirely unexpected - were detected in satellite observations and weather balloons that show at what altitudes the ozone loss is occurring. This year, the Arctic winter was warmer than average at ground level but colder in the stratosphere than normal. Now let's find a guru who can explain this, since everyone knows heat rises: hot air rises, as has been known since, well, forever, hence hot air balloons, etc. So now how does the stratosphere of the artic cool drastically, even as the surface and troposphere layer allegedly warms? "Now let's find a guru who can explain this .. "
I'm your guru (retired MetO forecaster). Heat does indeed rise and as the second poster stated an inversion will stop that heat rising. Now it so happens that there is a very big inversion between the Troposphere and the Stratosphere, and the Strat during the long NH winter loses heat to space, becoming confined ( largely ) into a vortex held there by thermal winds and the coriolis force. Whereas the Troposphere is subject to the vagaries of pressure gradient forces not of thermal influence ( warm incursions from normal weather systems ). There can though be disruptions to the Trop vortex, largely caused by upwelling waves from the Troposphere but that's another ( very complex ) story. In winter 09/10 the Strat was warmer than usual which lead to higher than usual Arctic and North Atlantic oscillations ( -AO and -NAO ) which had the effect of pushing cold air south. This happened to a lesser extent this last Dec too.